If you were to suggest that members of Elasmobranchii — the subclass of cartilaginous fishes that includes sharks, rays, and skates — look incredibly different from us humans, I doubt that many people would argue the point. 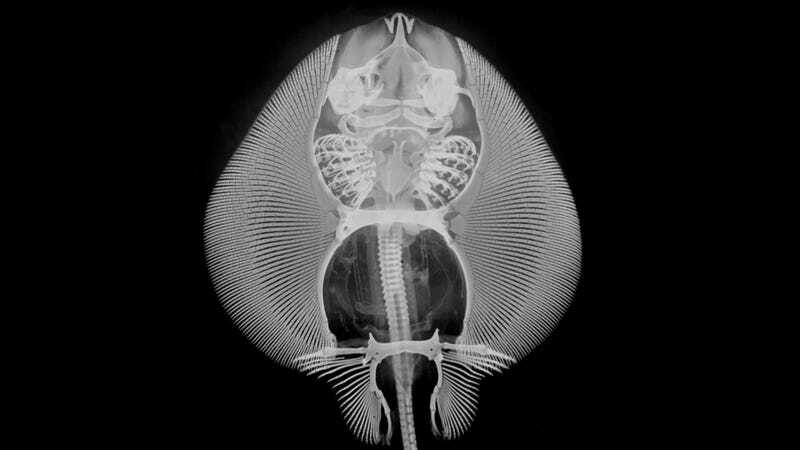 In fact, one look at the alien-like skeleton of Leucoraja erinacea, the species of skate pictured up top, would drive your assertion home rather nicely, wouldn't you say? But it turns out Elasmobronchii like L. erinacea (aka the "little skate") are even more alien than we once thought. Research published in today's issue of Science reveals that members of Elasmobranchii are the only known jawed vertebrates on Earth that are missing a portion of their genome known as the HoxC gene cluster — a crucial chunk of genetic information that, until now, was believed to be indispensable. For those of you familiar with genetics, the fact that these animals are missing HoxC genes should immediately give you pause. For everyone else, here's what's up. The information contained within clusters of Hox genes plays a crucial role in orchestrating an organism's structural development; they basically tell the body what goes where. In humans, Hox genes are vital to ensuring the proper patterning of developing ribs and vertebrae. In flies, a mutation in a Hox gene can cause them to sprout legs from their heads instead of antennae, like the one pictured here. In fact, Hox genes are so universally important that their sequences tend to be very similar across many, many species — even ones separated by hundreds of millions of years of evolution. Such gene sequences are said to be highly conserved; and when a gene as highly conserved as those in the Hox group go missing or become mutated, the result is almost always lethal. In the genes of every single jawed vertebrate that they've examined — humans included — scientists have found a minimum of four similar, but functionally distinct, copies of the Hox gene cluster. These clusters are named HoxA, HoxB, HoxC, and HoxD. In humans, each of these clusters comprises about 10 genes, totaling 39 Hox genes in all. Some species have more than four clusters (Atlantic Salmon, for example, have 13), but for decades, the general rule about Hox genes has been pretty straightforward: all jawed vertebrates need at least one gene from each of HoxA—D for viable development. But Elasmobranchii couldn't care less about the conservation of Hox clusters. In fact, when they can, they prefer to do away with them altogether. In an article published in today's issue of Science, researcher Benjamin King and colleagues have revealed that Elasmobranchii like the little skate, great white sharks, and manta rays have probably been getting on just fine without their HoxC gene clusters for quite some time. In fact, these animals haven't just shut down the molecular machinery that takes instructions from the HoxC gene clusters, they've actually deleted the HoxC genes from their genomes entirely; when King and his colleagues searched the genome of a little skate like the one up top, they found only HoxA, HoxB and HoxD gene clusters. The HoxC genes were nowhere to be found. "We demonstrate that two elasmobranchs (the dogfish shark and little skate) don't express HoxC genes and that the little skate genome also lacks a HoxC cluster," King told io9. "This suggests that all elasmobranchs (sharks, skates and rays) lack the HoxC cluster." It's important to point out that not all cartilaginous fishes lack the cluster. In their paper, King and his colleagues demonstrate that the elephant shark — which belongs to Holocephali, the other known subclass of cartilaginous fishes — expresses HoxC genes just like you and me. A goal of the field of evolutionary developmental biology is to learn how developmental processes evolved by comparing many organisms with one another," explains King. "Our work illustrates the value of studying elasmobranch fishes to gain new insights. If elasmobranchs do not need HoxC genes to develop properly, we must consider the possibility that there is more flexibility in the role of the various Hox clusters than we previously thought.